Even though butter's flavor is unmatched, sometimes when you are cooking a non-dairy meal for a holiday or you have guests with allergies, you need to omit ingredients that you usually rely on to make food taste good. I like a challenge! I searched the Internet for flourless chocolate cake recipes and they were all pretty similar (some combo of fat, chocolate, sugar and eggs). I read in a few recipes that butter could be substituted with margarine, so I went ahead with my plan. I'm not a huge fan of margarine and I wonder if this recipe could be made with coconut oil instead of margarine (it probably could), but I also didn't have time to experiment and figured decent unsalted margarine would work as a substitute for delicious butter. Choosing to sub out butter meant that every other ingredient had to be excellent. Actually, because this recipe has so few ingredients, it's a good idea to make sure each one is good. I chose very good chocolate (bar and cocoa powder), the eggs came from the farmers' market, and I decided to add instant espresso to boost the chocolate flavor. Espresso will do that to chocolate, but you won't taste any coffee flavor. This dessert is a home run for chocolate lovers. It's incredibly easy to whip up, and has a delightful moist texture. I served it with whipped coconut cream and a berry salad. Preheat the oven to 350°F. Generously spray a 9-inch springform pan with baking spray (it might be wise to grease it with margarine instead). Line the bottom of the pan with parchment paper and spray it again. Melt the margarine and chocolate together in a double boiler (basically a heat-proof bowl on top of a pot of simmering water... you can also do this step in a microwave, but I prefer to do it stove top). Stir the mixture occasionally as it melts until it is smooth and glossy. Set aside and cool for 5 minutes. Whisk in the cocoa powder, vanilla, and espresso powder. Set aside. In the bowl of an electric mixer fitted with the whisk attachment, or with the use of a hand mixer, beat the eggs, sugar and salt on high for 3-5 minutes. 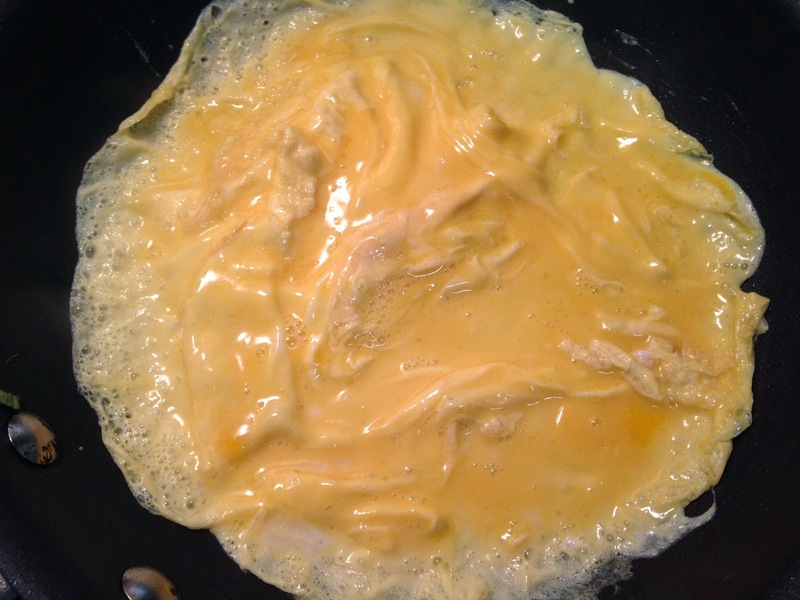 The egg mixture should become pale yellow and triple in volume. Magic! Pour the chocolate mixture into the egg mixture and carefully fold them together. Be careful not to overmix your batter. Pour the batter into the prepared springform pan and bake for 35-40 minutes, or until just barely set and a toothpick comes out pretty clean. Cool the cake in the pan for 30 minutes. Run a knife around the edges of the pan. Release the sides of the springform pan, and transfer the cake to a serving plate. It might look deflated and craggy, but looks don't matter here. Once the cake is fully cool, you can garnish it with gluten free powdered sugar or berries. Mine stuck a little to the side of the pan and I didn't mind. I like a rustic-looking cake. There's nothing wrong with traditional whipped cream. It's pretty flawless in its classic form. I'm happy to eat something decadent if it's delicious and used to top something warm that's just come out of the oven. However, certain occasions and situations call for non-dairy/vegan desserts. On those occasions, I have often wondered what would be a good non-dairy alternative to classic whipped cream. While working on the second season of Recipe Rehab I learned this trick from one of our chefs: take a can of regular coconut milk, put it in the fridge overnight, scoop out the creamy part that separates from the liquid, and whip it just as you would regular cream. I figured coconut cream would work just as well as coconut milk, and it did! You can use either coconut milk or coconut cream to make this delicious vegan dessert topping. The texture is just like homemade whipped cream, and the taste is mildly coconut-flavored. I served it with flourless chocolate cake and berries (recipe coming soon), but you could use it to top any dessert you'd like. Start this recipe the day before (or days before) by putting your canned coconut cream in the fridge. At least an hour before you whip the cream, place the bowl you plan to use in the freezer. It helps if all of your tools and ingredients are very cold. Add the coconut cream, agave (or other sweetener or none at all), and vanilla extract to the bowl you will use to whip the cream in. Transfer the whipped coconut cream to a bowl, garnish if you feel like it, and keep it in the fridge until you're ready to serve it. The nicest thing about soup is that it's just as good to make for one as it is for a hundred. As a single person, it's nice to make food that tastes better as it sits in your fridge for days. It's nice to come home from work and know that a nutritious meal is waiting for you, and will only take moments to reheat and enjoy. When cooking for a group, it's ideal to prepare something uncomplicated and satisfying that can be made in a single large pot, and can be reheated easily if your guests happen to arrive late or want to sip on wine and chat before they do any eating. In addition to its ease and long lifespan, soup is comforting; one large bowl can easily constitute an entire meal, and soup can be super healthy. So there. You're all set for life if you just know how to make soup. I highly recommend reading Tamar Adler's An Everlasting Meal: Cooking with Economy and Grace. 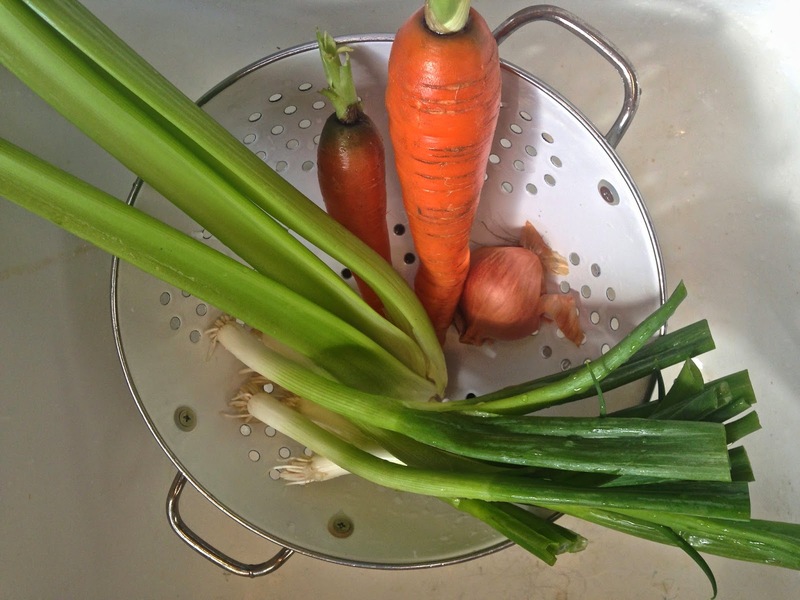 You'll learn a lot about soup, and how easy and varied soups can be. You'll also be wowed by exceptional prose, and a deep understanding of food. The book's insights and tips about cooking may be intuitively known among avid home cooks, but have rarely been put into such eloquent writing. So soup. Soup can be made with most vegetables, most beans, most broths, most proteins (including eggs, tofu and dairy), and well, most any edible thing you can stick in a pot. Things that can make soups especially wonderful are: acid (lemon or vinegar), tomatoes and tomato paste (also acidic), and fresh herbs. The other night I was craving soup and didn't feel like running to the grocery store. 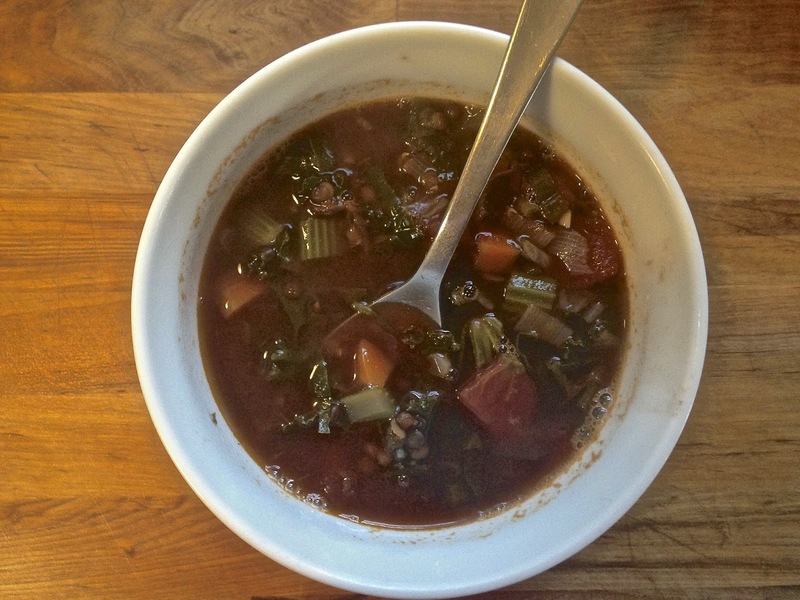 I had a few carrots, some celery, a large half of shallot, some scallions, garlic, some leftover kale and spinach, a can of tomatoes, and some dry beluga lentils lying around. I decided all these things could easily become soup, and they did. And it was delicious. And it ended up being a sort of not-so-attractive brown color (from the lentils), but it didn't matter because it tasted good, and I served it with toast and shredded parmesan on top, and it was filling, and I shared it with my neighbors and we all had a nice time on a quiet warm Sunday evening. So here's a recipe that means little, because any ingredient can be added, omitted, or modified in quantity. What you will need: a pot, water or broth, some vegetables, salt and oil, something from the onion family, and the desire to make a soup. 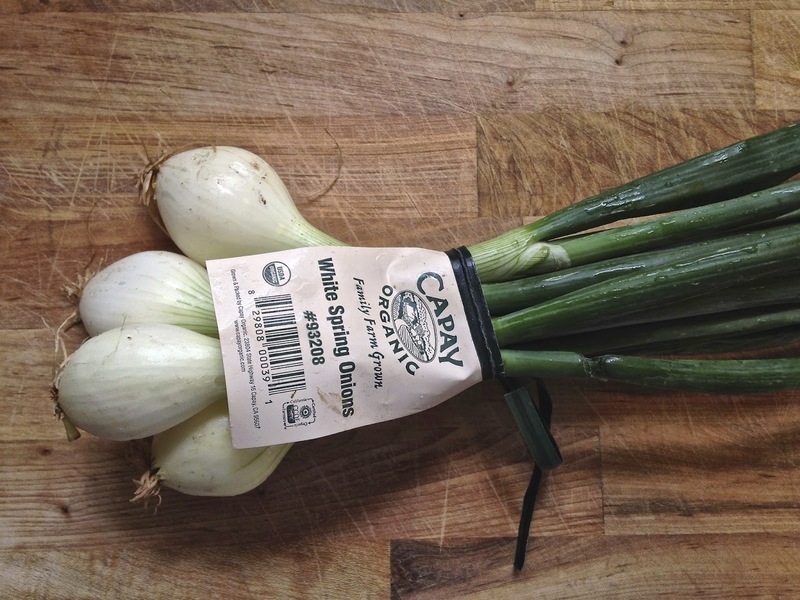 In a large pot on medium high heat, sauté your shallot, green onion, (you can use regular onion in place of both), celery and carrot with salt and pepper, for about 8-10 minutes or until the veg has softened. Add the garlic for a minute, then add the spinach and kale and let them wilt. Once wilted, add the lentils (rinsed first). Add the tomato paste, and stir everything about until it's all coated with the paste. Add the canned tomatoes and their liquid. Add a bay leaf, some thyme, oregano and more salt and pepper. Fill the pot with water (about 6-8 cups... you can use broth of some kind if you have it on hand). Let everything come up to a boil, and immediately lower the heat to a simmer. Partially cover the pot with a lid and let the soup simmer for about 45 minutes. Try the lentils. Are they done? Does the soup taste pretty good? Add more salt and pepper as needed. If the lentils still taste uncooked, let the soup simmer until they're fully cooked. Turn the heat off, remove the bay leaf, and add the red wine vinegar. Taste the soup again, and add any salt, pepper, or acid that you think it needs. Ladle into bowls. Shred some parmesan cheese on top. Serve with hearty bread. So long as I have a supply of elementary fresh things like eggs, onions, parsley, lemons, oranges and bread and tomatoes--and I keep canned tomatoes too--I find that my pantry will always provide the main part of an improvised meal. If this has to be made quickly it may just be a salad of anchovy fillets and black olives, hard-boiled eggs and olive oil, with bread and a bottle of wine. If it a question of not being able to leave the house to go shopping, or of being too otherwise occupied to stand over the cooking pots, then there are white beans or brown lentils for slow cooking... with onions and oil and possibly tomato... Or if I am given, say, forty-five minutes to get an unplanned meal ready--well I have Italian and Patna rice and Parmesan, spices, herbs, currants, almonds, walnuts, to make a risotto or a pilaf. And perhaps tuna, with eggs to make mayonnaise, for an easy first dish. The countless number of permutations to be devised is part of the entertainment. I'm on an egg kick. 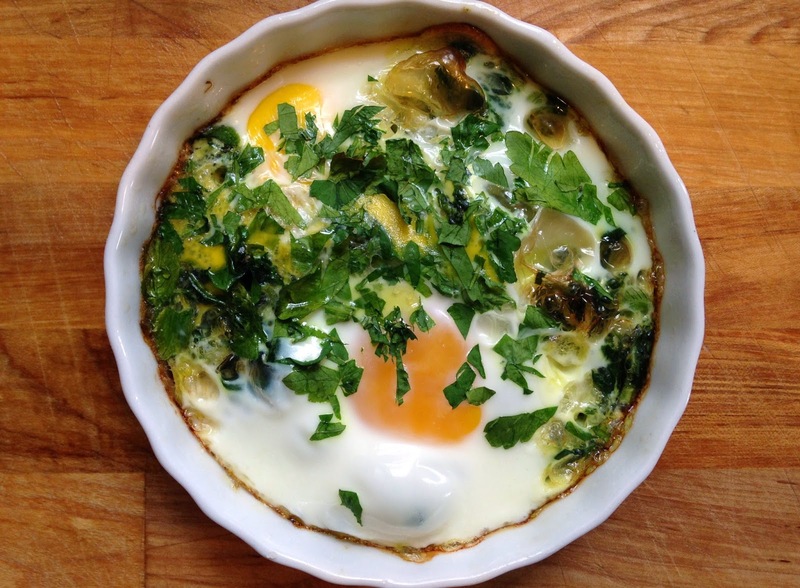 It's springtime and the eggs from the farmer's market are better than ever. Yes, farmer's market eggs are pricier than the ones found in the supermarket, but the difference in flavor is noticeably in favor of the more expensive option. I'm willing to spend a little more on things that are going to taste amazingly better. 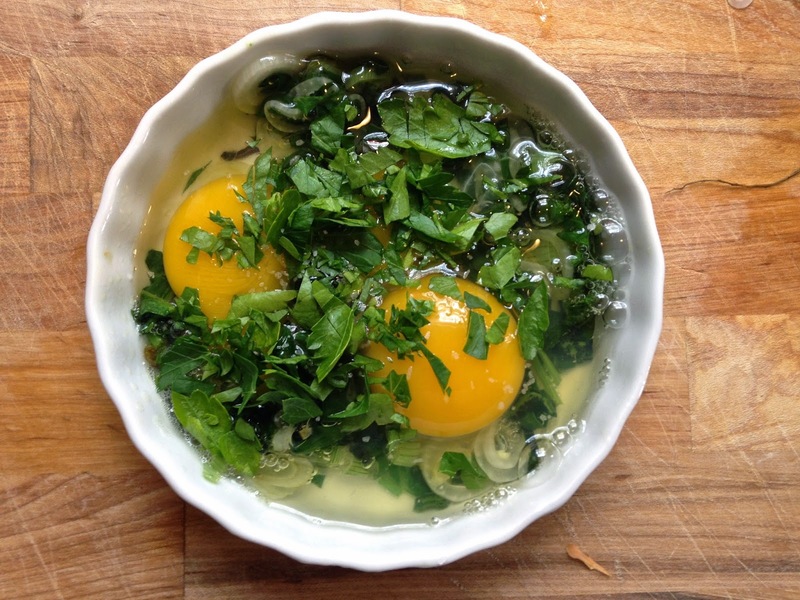 The yolks are darker, the eggs turn out creamier, and they just taste better in a way that words don't adequately explain. The other splurge for this meal was the bread. Again, I'm willing to shell out more dough (no pun intended) for something that is exceptional. I had been curious about these rustic loaves of bread at the Sunday Hollywood Farmer's Market, but the high price tag kept me away. Also, they don't offer samples (I sort of understand the principal of this, but on the other hand samples really work, and I probably would have been hooked on this bread months sooner if I had tried it). 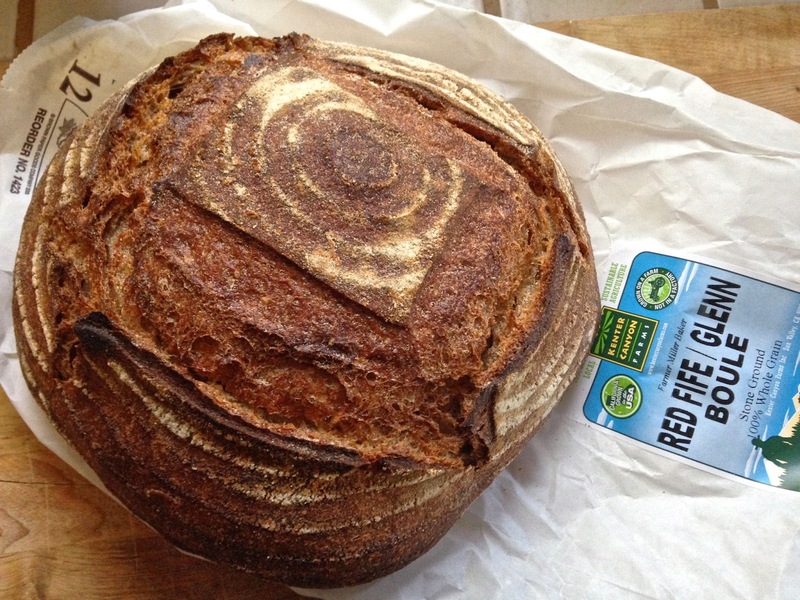 Ok, at the risk of sounding super bougie, here's what makes this bread special: Kenter Canyon Farm's makes these loaves from from locally grown heritage wheat berries, they mill the flour themselves, they bake the bread from a sourdough starter, and then they sell it at the local market and at Urban Radish. This bread is worth every penny. I'd argue that it's the best loaf of bread I've tried in Los Angeles. Back to the eggs... omelets can be filled with whatever you want (from fried chicken, to leftovers from dinner, to squash). It's best to prepare the filling separate from the eggs. The eggs only take a few minutes to cook, and you don't want to try and cram a bunch of raw cold things into a pocket of hot eggs at the last minute. You can use the same pan for both the omelet and the filling, just transfer the filling to the plate you're going to use for the final dish before you make the eggs. 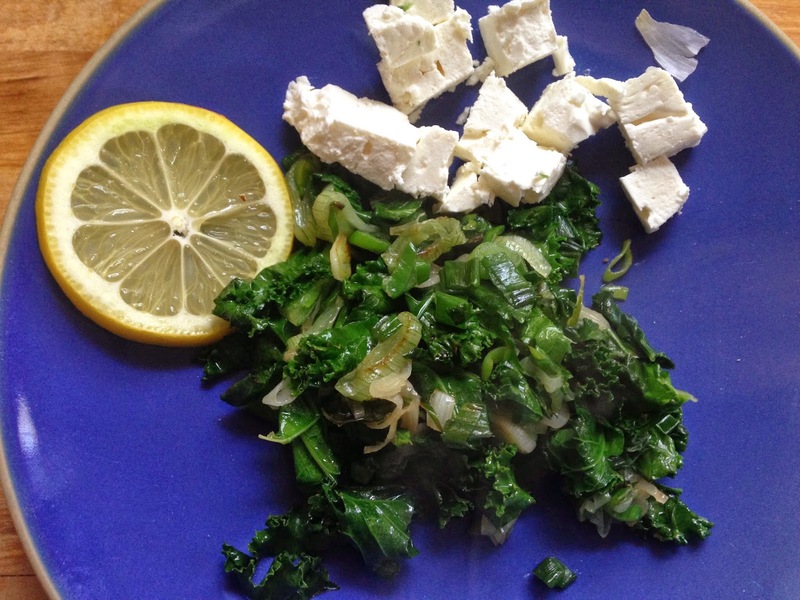 I had some spring onions, kale, and feta on hand. I like the combination of something green and something cheesy. Greens love lemon, and I gave the cooked kale and onion mixture a squeeze of lemon juice before I put them in the omelet. Actually, eggs are also big fans of lemon. I'm pretty sure everything is better with lemon. I ate this plate of lovely eggs, hearty greens, creamy feta, perfect avocado and buttered-garlic-rubbed rustic bread and my day just got better from there. 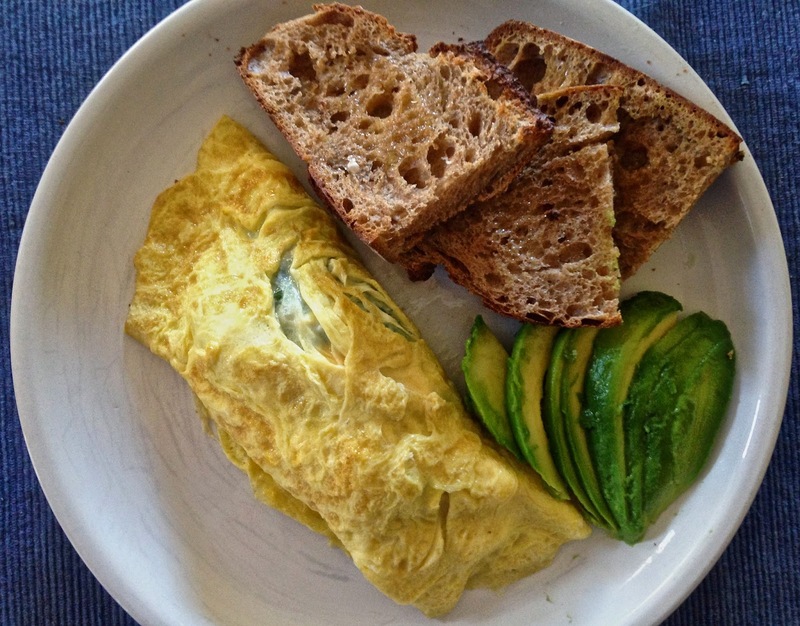 This omelet recipe is as flexible as anything, but it's hard for me to think about serving any omelet without a great piece of toast. Find a good rustic bread with a thick crust and soft center and you're set. as much crumbled feta as you like, or goat, cheddar, swiss, brie, etc. Prep your ingredients: in a bowl, crack open your eggs and add a dash of cream or milk. Whisk them up and season with salt and pepper. Chop up your onions and kale. Crumble the cheese. Peel a clove of garlic. Slice up some bread. Slice up some avocado. 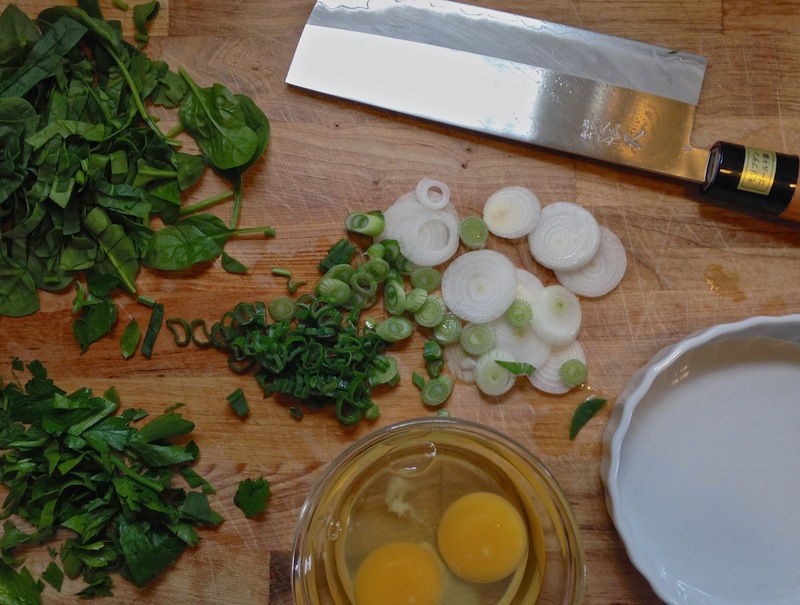 In an omelet pan (an 8-inch non-stick or whatever you like to use to make eggs), on medium high heat, sauté the kale and onion in a drizzle of olive oil with a sprinkle of salt and pepper. Once the greens and onions are wilted and cooked to your liking, transfer them to a plate. Squeeze a little lemon over the greens. Make sure your crumbled cheese is nearby; it's easier if all of your filling ingredients are in the same place. Before you cook the eggs, get your toast going. Toast will take longer than the omelet, and you don't want cold eggs or limp toast. Toast the bread. Rub the toasted slices with a raw clove of garlic, and then butter them. In the same omelet pan, add a little butter and olive oil. I would have used ghee (clarified butter), but I ran out. On medium high heat, add the egg mixture. With a spatula, lift up one side, tilt the pan, and let the raw egg seep into the empty space. Do this in different spots around the pan until your eggs solidify into a single layer. Once the omelet is still a little wet on top, add the filling, fold it over and slide it onto a plate. The eggs will continue to cook a bit even when you turn off the heat. Add the sliced avocado and buttered garlic toast to the plate. Serve and relish each bite. A moment of zen on this cloudy spring day from one of the godmothers of food writing.